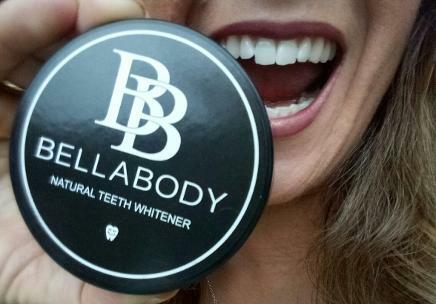 At Bella Body we can assure you will get instant results with our break through teeth whitening procedure that works at the speed of light. 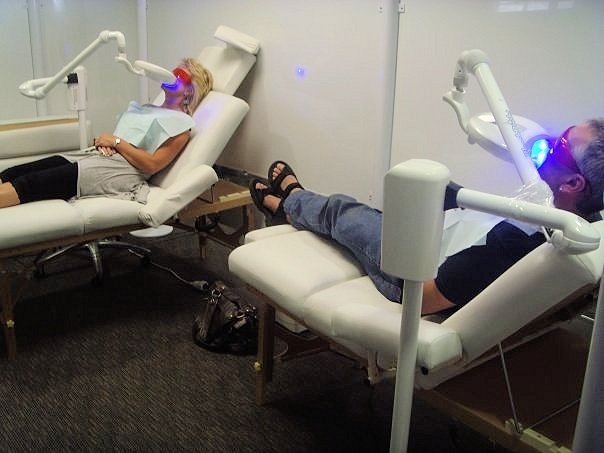 We use high quality dental grade products that are FDA - registered and meet the current NZ Teeth Whitening standards. Peroxide and Non Peroxide available. EU non peroxide teeth whitening is the safest whitening product in the world. Many dentists and non - dentists are now using this product as it gives impressive results. For a non peroxide product, we absolutely love it!! Gift vouchers, Wedding Partys, Group Bookings and Bride and Groom packages available. Owner and Teeth Whitening Technician Kelly, has tried and tested several different whitening products after completing her training in the UK in 2007 and becoming an internationally recognized qualified Teeth Whitening Technician , she whitened hundreds of smiles in Europe and in the United States of America before returning to New Zealand to manage a Teeth Whitening company in Christchurch. Now owning her own thriving teeth whitening practice which was established in 2010 she has 2 other technicians on board who are also certified in Cosmetic Teeth Whitening and Beauty Therapy. 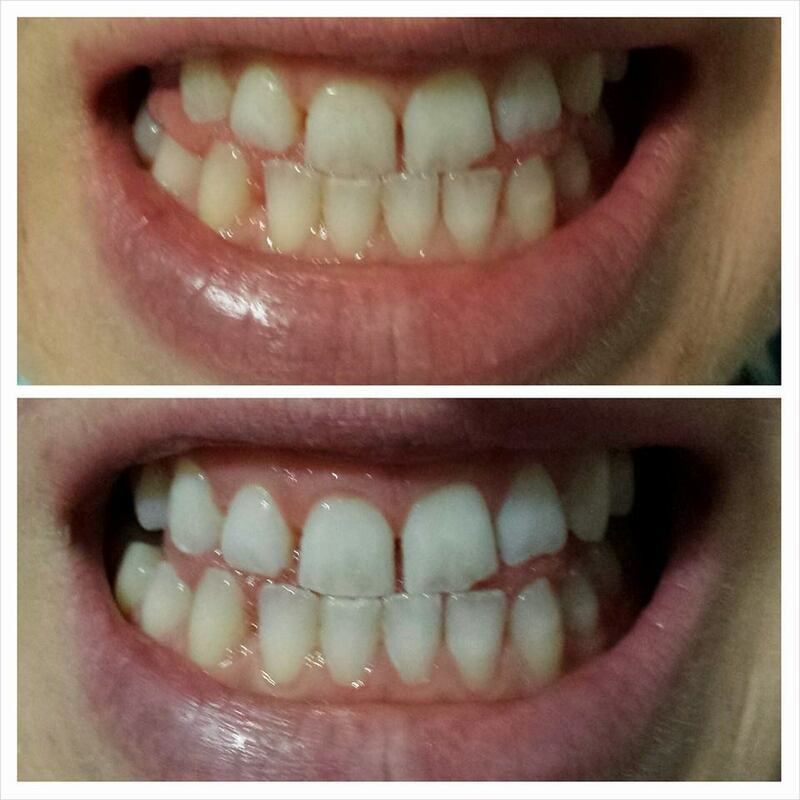 "I have full confidence in the product we use, we follow all guidelines for NZ Cosmetic Teeth Whitening and after trialing so many different kinds of whitening formulas this whitening formula is truly the best out there, no sensitivity, no gum damage, and results are not only awesome but 100% guaranteed!" Kelly offers the EU non - peroxide whitening which is great for people with more sensitive teeth. One of the first things that people notice when they meet someone is the look of their smile. Create a positive attitude for yourself and improve your appearance while achieving a more youthful look with your new radiant smile. This is not a medical procedure and is a safe product. When observing good dental hygiene, results will last atleast 2 years. The procedure itself is simple. 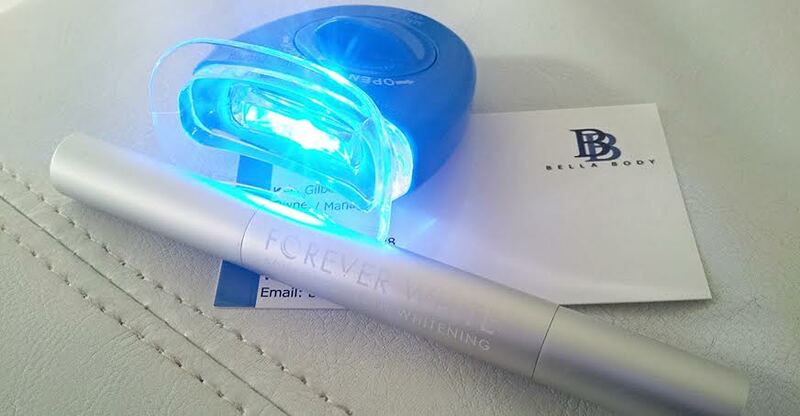 The spectrum blue LED light is positioned so that it focuses its energy directly onto the teeth which are covered in the whitening gel. The light activates the gel achieving faster results. All you have to do is SIT BACK and RELAX. 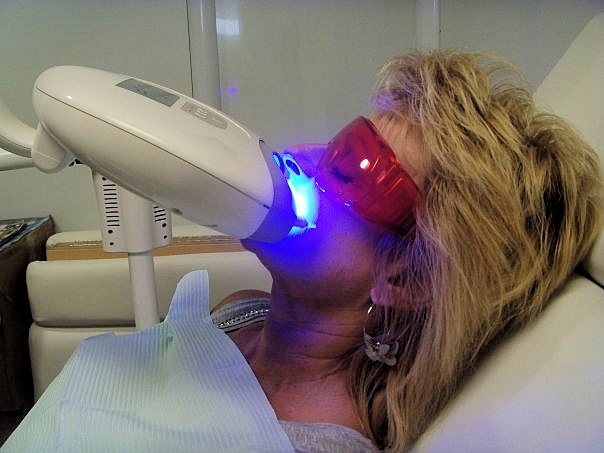 The process takes ONLY 20 - 60 MINUTES and is more effective than any other teeth whitening system currently available. It uses a combination of pulsed light, a whitening formula and a whitening accelerator to quickly and safely whiten your teeth. A typical treatment will brighten your teeth up to twelve shades. People with heavily discolored teeth will notice a remarkable difference. 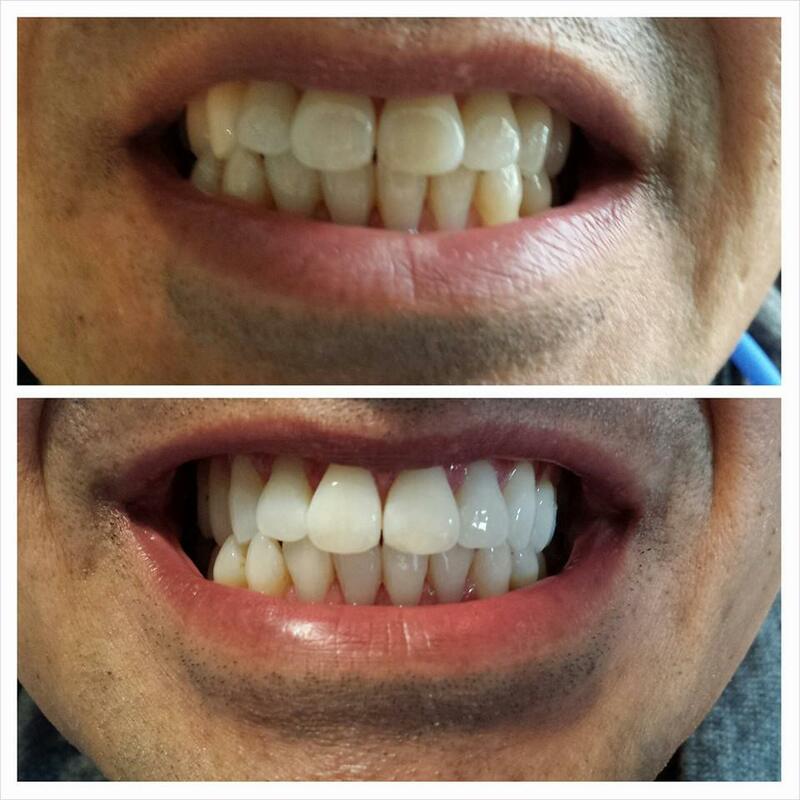 Those lucky enough to have white teeth can achieve an even whiter smile with the treatment. The procedure will not harm dental work, but will remove stains and make crowns and veneers less noticeable. Bellabody use Hydrogen Peroxide which has proved to give better results than Carbamide Peroxide. For clients with sensitive teeth the Non - Peroxide available is the better option. The process is SAFE, EFFECTIVE AND PAINLESS. A. There are many causes of tooth discoloration. Some of the most common include aging and heavily pigmented food and beverages. More serious causes are excessive fluoride or tetracycline (antibiotic) consumption. A. The active ingredient in the teeth whitening gel is hydrogen peroxide. The peroxide enters the tooth and safely removes stains by bleaching the enamel and dentin. We also have EU Non Peroxide treatments available also. A. Almost everyone. However, there are some cases where the treatment may not be effective. Tetracycline (antibiotic) discolorations and artificial dental work are usually not greatly responsive to dental bleaching. A. After trialing several different products at Bellabody we have full confidence in what we use and very rarely have we had anyone have any side effects. The most common side effect from tooth whitening is tooth sensitivity and gum irritation. These symptoms are temporary and would disappear after the whitening treatment. Gum irritation can occur especially when using mouth guards in a treatment that haven't been moulded for your mouth, we do not use this process therefore have full confidence in what we do. A. Yes. Decades of research have proven bleaching to be both safe and effective. A. This depends on the persons habits and the porosity of the teeth. The results will normally last 6 months to 2 years. If you use a touch up pen your results will most definitely last 2 years. Q Does everyone get the same result? A. Results can vary from person to person depending on the type of stains and the genetic tooth color. Removes nasty stubborn stains and discoloration associated with drinking coffee, tea and dark colored foods. Remineralise and strengthen teeth. Removes tartar. Cleans gums. Reduce oral infections and inflammation. 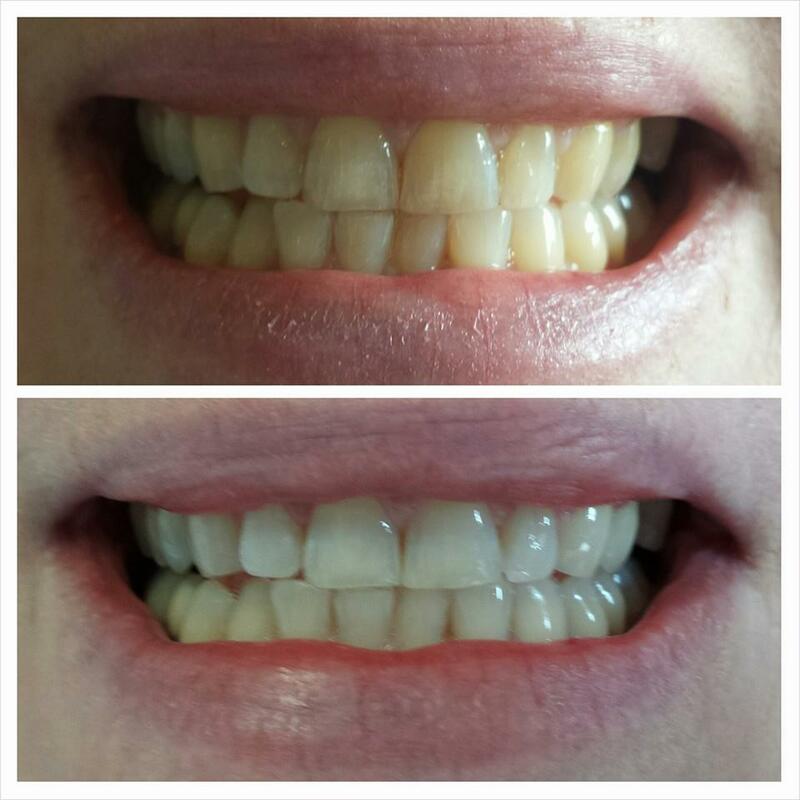 No chemicals just whiter teeth!!! Includes LED light, Whitening Gel, Thermoforming Mouth Tray for a comfortable custom fit, Mouth Tray case, Remineralizing gel to seal and strengthen tooth enamel, zipper travel bag. Use the Touch Up pen within 24 hours of your treatment, whilst your teeth are still porous, this will help to lighten your teeth an extra shade or two. Then use the pen before any special occasion, eg Job interview, wedding etc, to highlight your new smile. Available in Peroxide and Non Peroxide. ew smile.